At certain times of life we all touch into sacredness, whether this rises in the presence of Nature's beauty, the birth of a baby or in death. Yet we can also attend at rituals wherein we achieve the state of intentional sacredness by performing very specific actions with intense concentration and an attitude of service and humility. This is a transcendental condition during which we participate in the conscious spiritual evolution of our species, the Earth and the Cosmos..
Our claims are greatly empowered and defined through ritual, ever has it been so. The perfecting of life lies in making each and every part sacred, and we have to reach the level at which we know not only that we ourselves build sacredness but also how to do so. 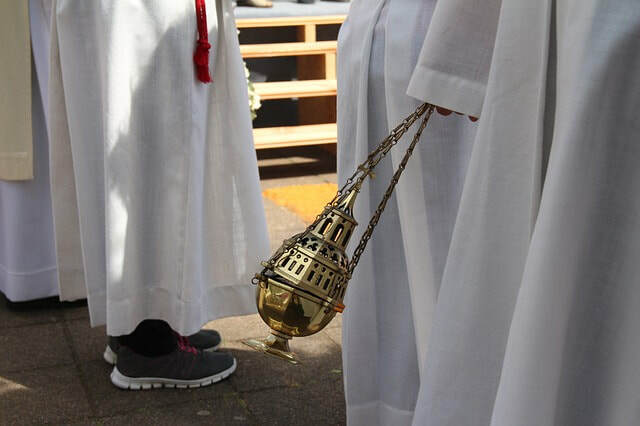 Ritual burning of incense goes together with chanting the name of God, lighting of altar candles and kneeling in prayer, as examples of methods to create an atmosphere of sacredness, and rapture is both the precondition and the result of impeccable sacredness. Although this is done within a community context, nevertheless such an activity has an individual, self-seeking dimension – since it is thus that the practitioner reaches out and initiates their personal claim on the world. Each person one meets can be encouraged to resonate at a higher vibration, through ceremony and sacredness. Such encouragement acts as a claim since the energy of their awakened sacredness is directed first towards the claimant. We must dedicate ourselves fully to this task if it is to be effective; achievement of purpose is entirely dependent upon the degree of our perception of self-worthiness for such an elevated process. This is our best work and is not to be diminished by the restrictive fears of false modesty; it is optimised by unlimited faith. If the involvement is not total, if we are unable to overcome laziness or apathy, if passion is dull – then the ritual is empty and no deep remembrance will occur of the soul’s perfect and innocent condition. A cake without the icing. This whole story is about remembering how to awaken the support of the subtle forces that are beyond scientific measurement – often described as God’s work. Whether we see the highest as within us or separate, still we have a more complete claim on life when we recall it. It behoves us to find the words by which to call upon the highest; one method is to learn mantra and the holy names. Spiritual activity is so often practised as a group interaction. This is explained by the intuitive knowledge that nothing may actually be fully owned by an individual. All is shared, in both material and subtle realities. We optimise our personal evolution by placing a high degree of importance on spiritual communion. Evidence of success – that we have somehow found a state of grace where self-demonstration and self-abnegation are both transcended – is found in our ability freely and at a moment’s notice to practice the condition of rapture. Most committed celebrants have daily rituals of prayer and devotion by which to remember and practice, and routinely participate in gatherings with kindred spirits to further this ability.